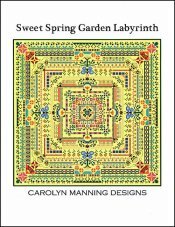 Garden Labyrinth: Sweet Spring [J5517] - $15.00 : Yarn Tree, Your wholesale source for cross stitch supplies. Cross stitch pattern by Carolyn Manning Designs. Butterflies are fluttering, bees are buzzing & flowers are blooming. Why, hello spring! Enjoy the gorgeous colors of spring as you stitch this design. Beauty is in bloom! Stitch count 224w x 224h.